The CTU encourages unions and workers to fill in this survey if you haven’t already . 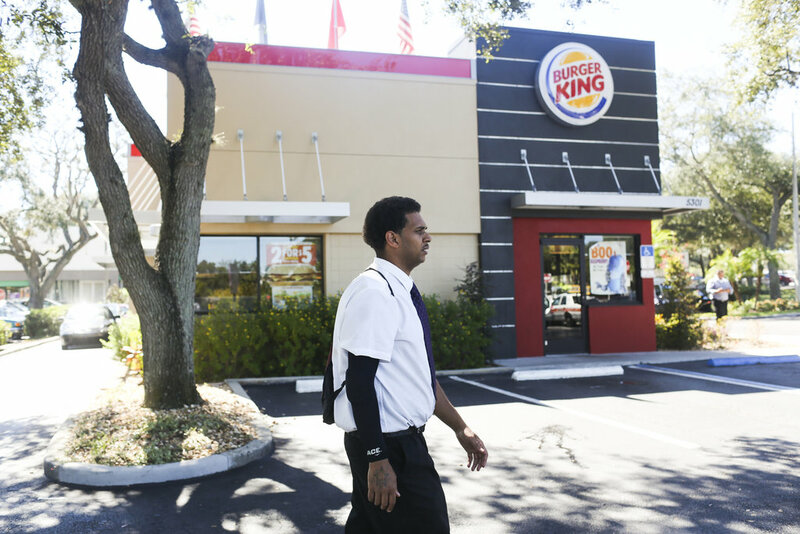 It will provide important empirical data for the Living Wage and other wage campaigns. 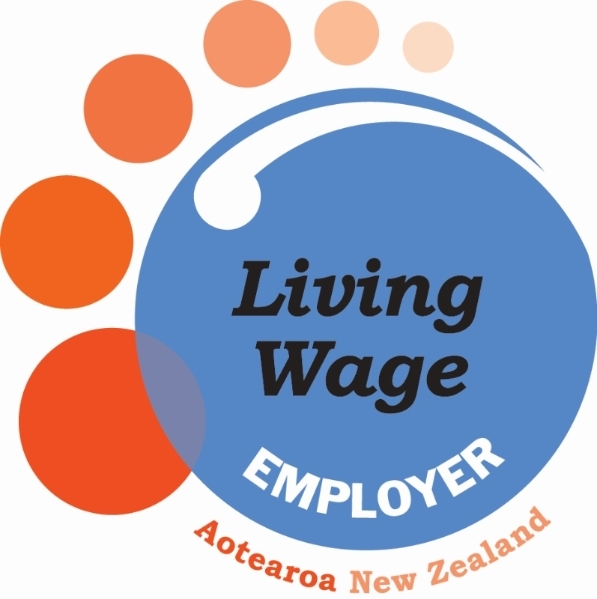 As part of a funded empirical study, a Massey University People, Organisation, Work and Employment Research (MPOWER) team is running a national online Living Wage survey. COPENHAGEN — On a recent afternoon, Hampus Elofsson ended his 40-hour workweek at a Burger King and prepared for a movie and beer with friends. He had paid his rent and all his bills, stashed away some savings, yet still had money for nights out. With an eye to workers like Mr. Elofsson, some American labor activists and liberal scholars are posing a provocative question: If Danish chains can pay $20 an hour, why can’t those in the United States pay the $15 an hour that many fast-food workers have been clamoring for? New Zealanders in at least sixteen different locations around the country are organising for an International Day of Action against the Trans-Pacific Partnership Agreement (TPPA) on 8 November, co-ordinated by It’s Our Future NZ. This is part of an international day of action to coincide with the next gathering of TPPA ministers and leaders around the Asia Pacific Economic Cooperation forum in November. Simultaneous actions are expected in Australia, Malaysia, Japan, Canada and the United States. 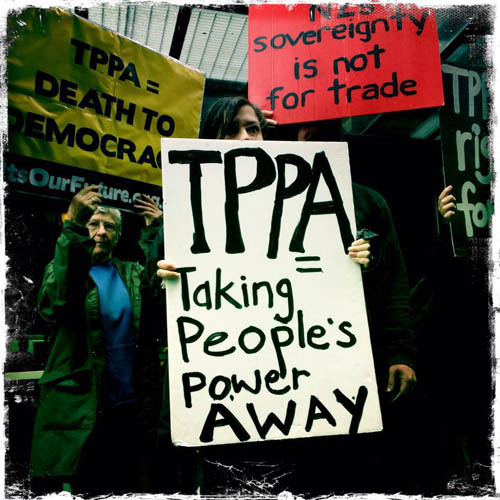 While there is huge pressure to conclude from participating governments and corporate lobbyists, more and more New Zealanders are starting to realise the significant impact the TPPA could have on their everyday life, according to It’s Our Future NZ spokesperson Edward Miller. "When Prime Minister John Key met President Obama in June this year, the pair discussed a November deadline to release a final outcome. We’re now days out from that deadline and the US and Japan are still locking horns over agriculture," said Edward Miller. "Trade Minister Groser has overestimated his negotiating prowess when he says that Tokyo and Washington will need Wellington’s approval before finalising a deal; once the majors have settled then our input will be little more than an afterthought." “Putting New Zealand’s name to such a deal would come at serious costs to internet freedom, affordable medicines, the right to regulate industries like mining, forestry or finance more tightly, and much more’. "Concerned citizens around the country have been organising actions for 8 November to get the message out there that they don’t want secretly negotiated deals that could endanger their jobs, their health, their livelihoods, their environment and their democracy." “We are urging the government to listen to the will of the people on 8 November and not to sleepwalk into the TPPA corporate trap." The sponsors of the 8 November action are Actors Equity, Campaign Against Foreign Control of Aotearoa, First Union, Greenpeace, Maritime Union of New Zealand, New Zealand Council of Trade Unions, New Zealand Nurses Organisation, Oxfam, Post Primary Teachers Association, Public Service Association, Tertiary Education Union. Actions have been planned for the following centres: Auckland, Hamilton, Raglan, Tauranga, Rotorua, New Plymouth, Napier, Palmerston North,Levin, Wellington, Nelson, Christchurch, Timaru, Dunedin and Invercargill. Call centre workers fear calling in sick. By Shanna Reeder, Unite call centre organiser. We’ve been receiving an increasing number of phone calls and emails from our call centre union members regarding the “negative” treatment they get for taking sick leave. 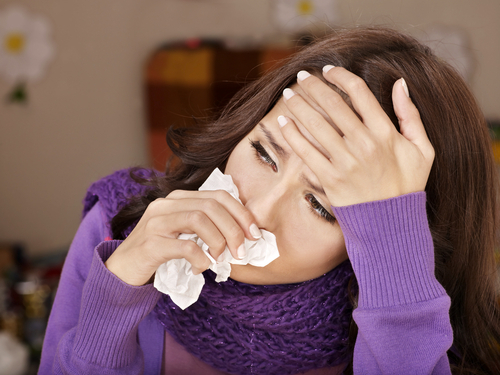 Sick leave is a basic right for all employed people in New Zealand. Paid Sick Leave is prescribed under current legislation as at least five days after six months employment. In some workplaces there are provisions in the collective employment agreement for workers to have more than five days paid sick leave per year. Sick leave can also be accumulated year to year up to 20 days by law although some collective agreements have a higher cap on how many days can be accumulated. Regardless of this, some of our workers in call centres fear or avoid taking sick leave as they have seen their co-workers get dragged into meetings with supervisors on their return from leave to discuss the details of why they have been away. Members have been asked why they were sick, what their sickness was and what medications they are on. 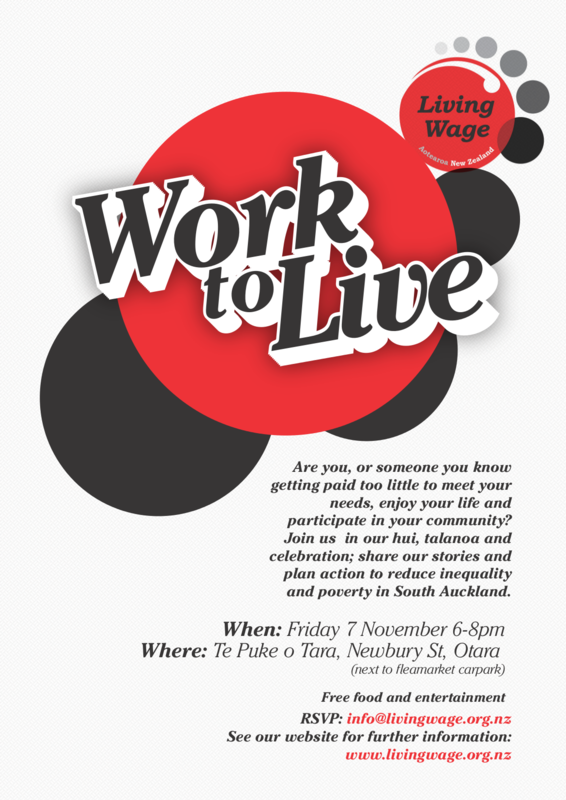 Work to Live – a hui, talanoa and celebration mark an important step toward involvement of local networks in the Living Wage campaign. Does your organisation, your faith group, or your union have connections with South Auckland communities? Help our communities come together around the concerns they share about poverty and inequality and start planning action for 2015 so our united voices can make a difference to the well being of local workers and their families. On November 7 a team of Living Wage supporters will be running a celebration with conversation – and of course food and music. For more information contact us at info. Here is our fine Wellington team at the first of two AGMs for the Living Wage Movement on October 16. Come along to the Auckland AGM on Friday October 31 at 4.00pm. Details above. 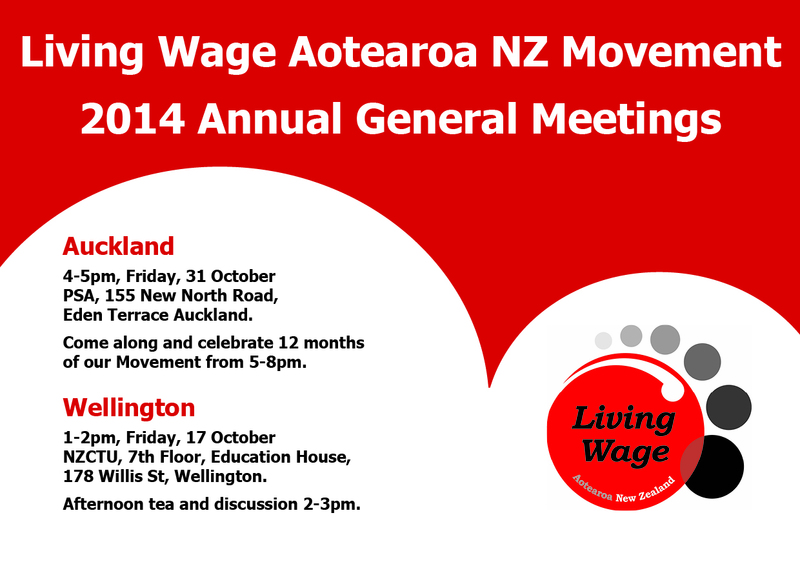 After the AGM there is a celebration of a successful year for the Living Wage Movement in Auckland. Food, drinks and an amazing raffle to support our leadership training programme. See details for the party below and RSVP to events. 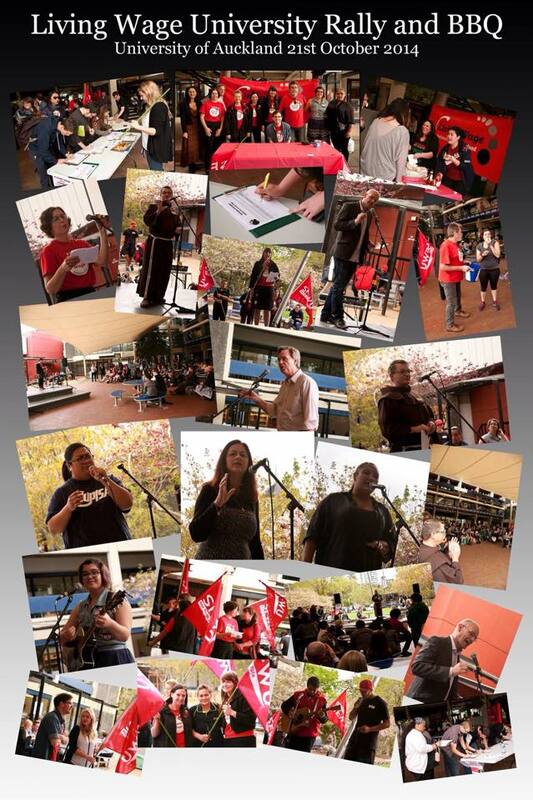 Auckland University students, lecturers, and campus communities step up for a Living Wage. "We’re offering a really nice product and if my own employees can’t afford to eat it then that’s not good; its better for us as a business if they can afford to eat there." You can see the paper presented to the Population Health Congress at www.livingwage.org.nz under the News section. 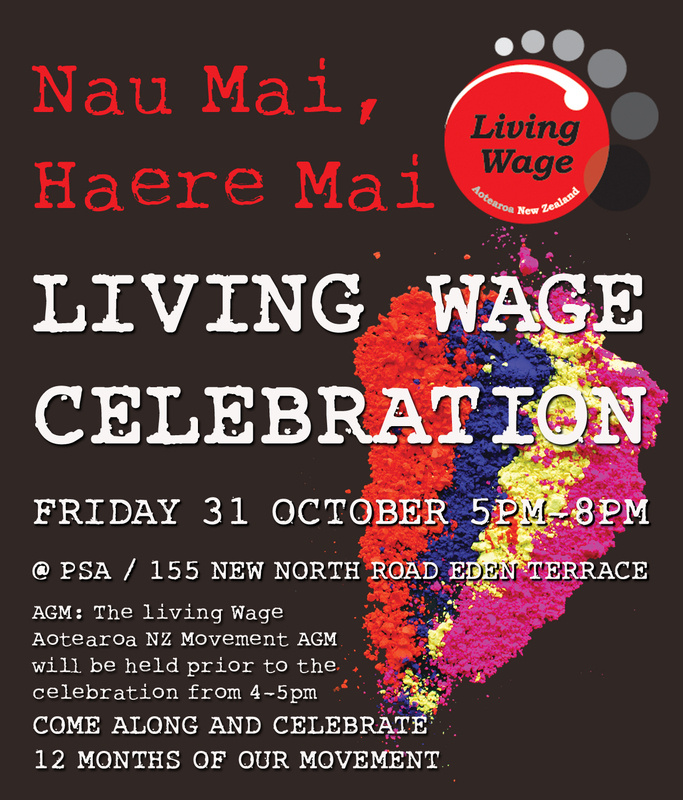 CHECK OUT OUR WEBSITE AS WE CONTINUE TO FEATURE OUR MEMBER GROUPS PROVIDING THE BACKBONE OF THE LIVING WAGE MOVEMENT AOTEAROA NZ! Massey University People, Organisation, Work and Employment Research (MPOWER) team is running a national, online Living Wage survey. The survey will seek to find out how people feel about the Living Wage in NZ and what they perceive that it means for employees’ income level, well-being, engagement at work, workplace productivity and capacity to have a decent standard of living. If you are an employee, manager or employer in New Zealand, please take part – it will only take you five minutes to complete the survey and gives you an opportunity to have your say about an important societal issue. You can access the survey at our website: www.livingwage.org.nz just click on the button on the Home page. The survey which closes at midnight on 31 October. Today the Court of Appeal has made a historic decision paving the way for a substantial equal pay claim for aged care workers. The Court of Appeal decision supports the case of caregiver Kristine Bartlett and her union, the Service and Food Workers Union, that in female-predominant industries the claimant may have to go outside the “infected” industry to decide what the female workers should be paid. “I am over the moon about the Court of Appeal decision,” said Kristine Bartlett. “I am nearing the end of my working life but am pleased that the Court of Appeal has confirmed what I always thought – caregiving is not recognised or paid fairly because most caregivers are women.” Bartlett said. “I urge the employers and Government to abandon any further appeals in favour of getting around the table with my union to sort out a just solution,” said Kristine. 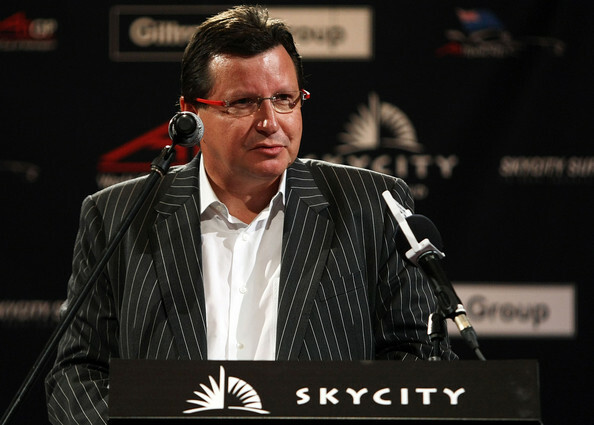 Service and Food Workers Union National Secretary John Ryall said the Court of Appeal decision came 42 years after the passing of the Equal Pay Act and once implemented would substantially narrow the gap between the wages of men and women in New Zealand.